Here is the tripod group as shown on the tripod group page. There is detailed information on how to defend against different attacks, but no mention of how this group might get formed. I found, for instance, the L group page very useful because it allows me to quickly realise if I can kill a group by making that shape. However, I don't see how I might be able to make life by forming the tripod group. So, when might a defender be able to force the tripod group? This is reasonable, but quite unlikely as 4-2 point openings are generally suboptimal. 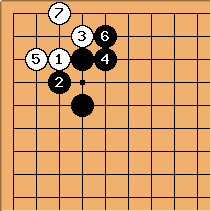 The tripod group may occur as the result of a invasion under a shimari. 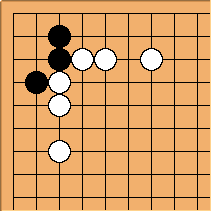 When the outside is more valuable than the corner, allowing White to live small while Black makes outside strength is the correct direction of play. 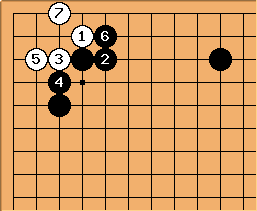 This example comes from Takemiya Masaki's book Enclosure Josekis, page 2. Velobici's example is definitely the most common situation in which I encounter it... I think I've seen it come up other ways, but I wouldn't be able to come up with an example. 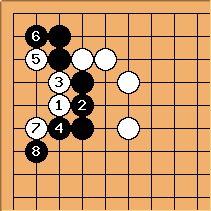 In general, I think that given the position of the Black stones, you can say that this corner aji is a feature of komoku sort of like the 3-3 invasion is to hoshi. It can also arise under mokuhazushi of course. 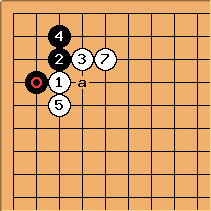 Unlike with the 3-3 invasion under hoshi, it's generally possible to avoid allowing the opponent to live in the corner, but doing so allows various forcing techniques to be employed outside. Yes, and yes. There's some more analysis on the probe page. An example which I recall offhand. Original poster: Ahah! Thanks, these are interesting replies. I will add a link to the tripod page to probe (having of course missed the "referenced by" link orginally). 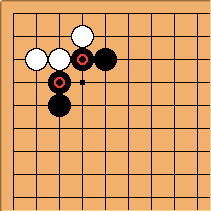 This is the result of a 4-4 point joseki. 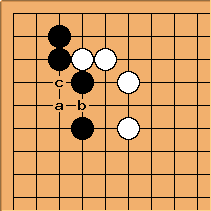 Now, even if white gets strong in the area, a white play at a may be answered with b, because after white c black can make a tripod group and is alive. 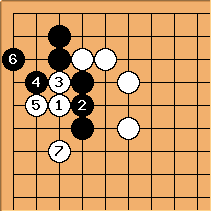 Depending on the surroundings, this may be the strongest way to play for black.